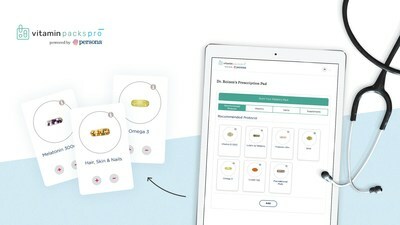 SEATTLE, Dec. 6, 2018 /PRNewswire/ -- Persona™, the leading personalized vitamin program, today introduces Vitamin Packs Pro™ powered by Persona™, a physician portal that gives health care practitioners a dedicated nutritional assessment and dietary supplement analysis for their patients. Vitamin Packs Pro is designed to support a patient's holistic health by giving physicians a quick and easy way to cross-reference more than 650 prescription medications to avoid risky drug-nutrient interactions. The new portal debuts at the Cleveland Clinic 16th annual Dr. Michael Roizen's Preventative and Integrative Medicine Longevity Conference. The Conference, held at the Four Seasons, Las Vegas, from December 7-9, is designed for all medical professionals with an interest in applying preventative lifestyle and integrative medicine approaches into their practice. Through its new portal, Persona is creating an unparalleled platform – giving medical professionals a tool to create or review vitamin and supplement recommendations for their patients. The first of its kind, Vitamin Packs Pro, seamlessly integrates vitamin and supplement regimes for the physician and the patient. Practitioners log into a personalized dashboard to guide patients through Persona's established nutritional assessment or input custom vitamin and supplement recommendations through the Prescription Pad app. Both modes retain Persona's unique drug-nutrient interaction identification. For more information about Vitamin Packs Pro, please visit www.vitaminpackspro.com.